I love apples, especially in my dessert, so there is no limit to how many I could create! 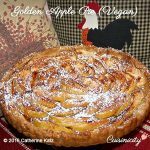 This Golden Apple Pie is the vegan version of my French Apple Tart. I am amazed that it is almost as rich tasting as my original, which already was nutritious and delicious. The crust is made with white whole wheat flour which is light and delicate but still rich in fiber and white wine and extra virgin olive oil…say what? There is very little added sugar (1/3 cup + 1 Tbsp for the whole thing!) but it’s plenty sweet. The golden delicious apples are nestled in a lovely “creamy” custard made out of unsweetened applesauce (more apples, but of course! ), almond meal and pure vanilla extract…and all that, without cream or eggs of course since I made it vegan! I sprinkle the top with cinnamon and….WOW the scent in the house is so heartwarming! It is so YUMMY, I LOVE it! Place all the crust ingredients in the bowl of a food processor and process until a soft ball forms (30 seconds). The dough will be sticky, that's OK--sprinkle it with a little flour (no more than 1 Tbsp flour), enough to gather it in your hands and make it into a ball. Place it on a piece of parchment paper and using a rolling pin, gently roll into a circle about 12 inches in diameter. Transfer onto an 11" tart pan with removable bottom (see photo at the bottom of the page) and gently press the dough against the rim all around to make a nice border. Spread the custard evenly over the dough. Spread the sliced apples in one layer so that they look pretty. Bake in preheated oven for 25 minutes or until the apples are juicy and tender and the crust is golden. Let cool and sprinkle with a dusting of confectioner sugar, if you'd like--not necessary--just so pretty! I also am looking for an alternative to the wine. I like the idea of your vegan custard not needing plant milk. Years ago I bought your book with a photo of you and your family and your dogs which I just love looking at! Numa, Thank you!! 🙂 Maybe you can try apple cider (100%) to replace the wine and see how it goes! Pardon me, but this recipe is obviously quite high in sugar. It would be very helpful if you provided a nutrtional profile, such as the amount of total sugar (including the fructose from the apples), calories per slice, and total carbohydrate per serving, Thank yoiu. Having said that, I can appreciate your wanting to see a nutritional analysis. I give away all my recipes and they are an open book, with every ingredients listed for those who really like the nutritional profile, so please feel free to enter them in any online analytical tool. This recipe is actually quite low in added sugar (1/3 cup) for a dessert, or a regular apple pie typically loaded with added sugar. Apples are wholesome and nutritious and they are a perfect natural and healthy “sweetener”. This looks delicious! My 9yo daughter has been asking me for apple pie but is allergic to wheat/gluten/eggs/dairy. This recipe looks right except for the wheat flour. Do you think it would work with a gluten-free flour or flour blend? I can see the white wine is a crucial component so the wheat flour might be as well. It’s just this recipe looks so easy and delicious and I can’t wait to try the custard. Thank you! We’ll give Bob’s Red Mill 1-to-1 a try for the crust. I’ve never found a GF/DF/EF crust that we liked so if the pie part turns out yummy (as I anticipate it will!!! ), I might use this as a test to try different combinations until I hit the right one. Thanks so much! We’re trying this recipe this week for Thanksgiving. Catherine, thank you for your blog and for sharing your delicious recipes. I have been following you since 2015. I don’t get to leave a comment very often and that is a mistake because I want you to know how much I appreciate your work and your passion around sharing good recipes. Thanks to you and David for your work. You inspire me everyday !! Oh my Goodness Sandrine, Thank you so much for your lovely comment, I appreciate it so! PS: I love your name!! Our daughter Natalia’s middle name is Sandrine! 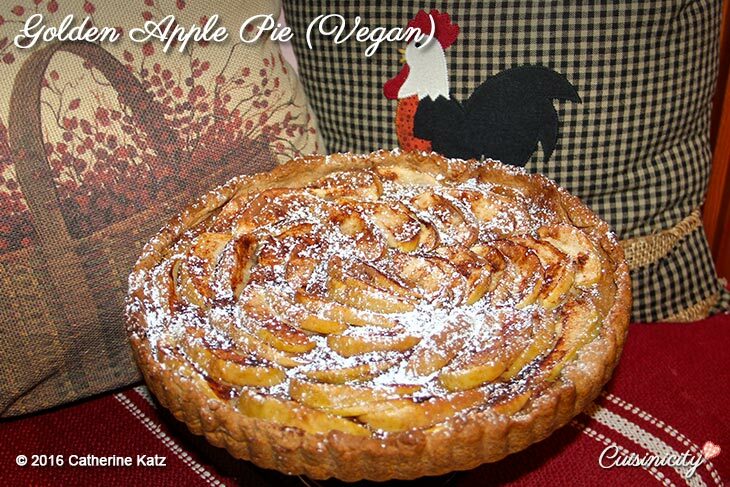 Oh, Catherine, we have a new addiction- tarte au pomme a la Catherine! Yum, twice a week during Apple/plum season. It is also delicious mixed a plume flower in the middle and apples around it. I just realized I never answered your lovely comment from last month until just now, coupled with yesterday’s!! I am ALWAYS so happy when I see your name appear in my inbox because I know I am going to get a glimpse into your beautiful growing family! (I’ll never forget the apple muffin story during your labor, it is my favorite story of all, as my own family can attest!!) As always, thank you! You always give your dishes and goodies such a lovely touch (wow a plume flower in the middle how GORGEOUS is that!). It is so gratifying to know how lovingly you prepare my recipes, and it does my heart so much good! Any alternative to white wine?